Our E-Beam evaporation process provides excellent film thickness control and can deposit up to six different materials in-situ. E-Beam evaporation is often used when precious metals deposition is required and is an excellent choice for wafers that require lift-off processing. In order to ensure the best results for metal lift-off, the underlying wafer and photoresist must be kept cool during metal deposition. This can be difficult to achieve while depositing thick layers. Rogue Valley Microdevices has developed a specialized low temperature E-Beam evaporation process specifically for use during metal lift-off processing. 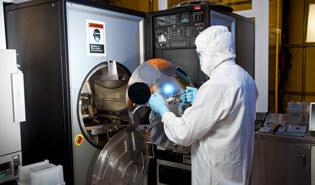 The surface preparation of patterned silicon and quartz wafers intended for lift-off metal is also extremely important. 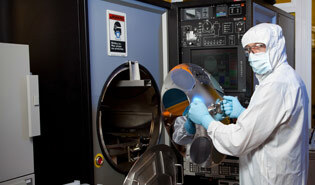 We include photoresist bake and O2 descum steps just prior to deposition to improve film adhesion. We offer a wide variety of E-Beam evaporation precious and non-precious metals. Non-precious metals and dielectric materials are available for sputtering.